(Bloomberg) -- Turkey’s foreign-currency reserves are plunging -- but officials aren’t saying why. 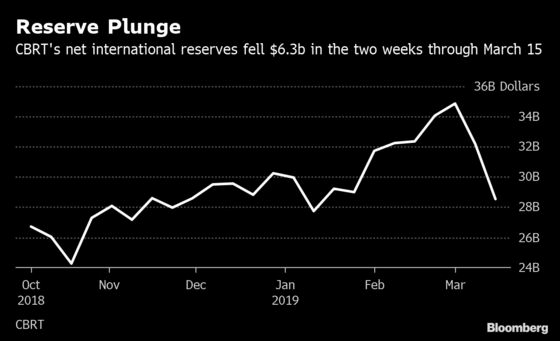 The central bank’s net international reserves fell $6.3 billion in the two weeks through March 15 to $28.5 billion, according to data published Thursday. That’s the biggest drop since January 2014, when the regulator was forced into raising rates in an emergency meeting to prop up the lira. The erosion outstrips the Treasury’s $3.8 billion external debt payments scheduled for March and is baffling analysts who are having trouble squaring the discrepancy. The lack of an official explanation on what’s behind the drop is adding to speculation that the central bank may be trying to support the lira using its reserves. “Since external debt repayments can’t explain the decline in reserves, markets are assuming there is intervention going on,” said Henrik Gullberg, a strategist at Nomura Plc. in London. The lira fell as much as 2.1 percent to 5.5814 per dollar on Friday, leading declines among 24 emerging-market currencies tracked by Bloomberg. A central bank spokesman wasn’t immediately able to comment when reached by phone. The central bank regularly sells foreign currency to state-run energy distributor Botas, which imports gas from Russia. Last year, the central bank sold the company just over $1 billion in March. “If the drop in the week of March 15 is not related to Botas, authorities need to explain what happened,” Haluk Burumcekci, founder of Istanbul-based independent research firm Burumcekci Research and Consulting, wrote in emailed note.